Every day, Watch This offers staff recommendations inspired by the week’s new releases or premieres. This week: Before setting sail for The Finest Hours, check out these classics set mostly at sea. Captains Courageous, based on the Rudyard Kipling novel, is an adventure story about a young boy tossed into seafaring circumstances, but much of its charm derives from just how non-fantastical those circumstances are. No pirates, giant squids, or buried treasure here; just a bunch of working-class fishermen teaching a spoiled brat how to be a decent person. That brat, wealthy preteen Harvey (erstwhile Little Lord Fauntleroy himself, Freddie Bartholomew), is reprimanded at his boarding school for wretched behavior, and sent to accompany his often-absent father on a business trip to Europe. 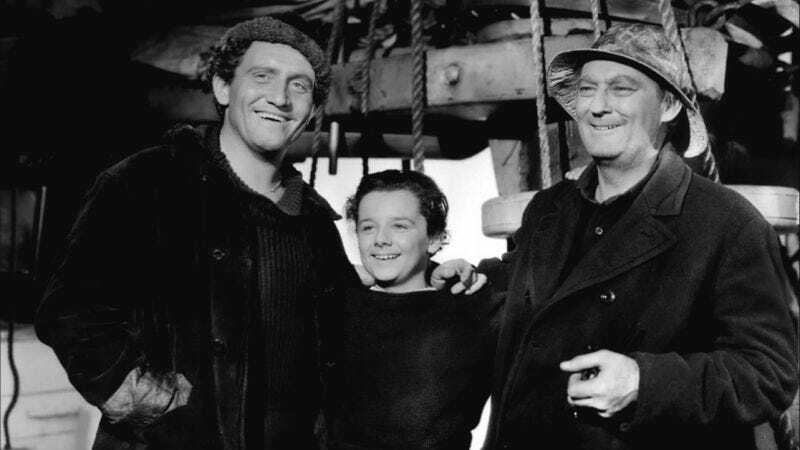 On his way via ocean liner, he gets knocked overboard and fished out of the briny deep by Manuel (Spencer Tracy), who brings him aboard a fishing vessel setting out for the season. The ship’s Captain Disko (Lionel Barrymore, who in his grizzled-captain guise looks a tiny bit like Tracy would as an old man) refuses to jeopardize his livelihood by returning Harvey to the mainland, and instead offers him a small wage to work on the boat for three months. Though Harvey resists at first, the principled but kindly Portuguese-American Manuel—whose name almost everyone pronounced as “manual,” as in manual labor—takes the kid under his wing and teaches him some life lessons about honesty and hard work. The conceit of a working-class man teaching a posh youngster how to really live might seem pat or condescending today, if not for Bartholomew’s convincing entitlement and, especially, Tracy’s relaxed conviction; he won a Best Actor Oscar for his work. But this isn’t just a performance showcase; Captains Courageous has plenty of classic studio production value. Director Victor Fleming was just a few years away from his double triumph of 1939, the year of both Gone With The Wind and The Wizard Of Oz; this movie isn’t quite so epic in scope, but its ship footage has a muscular, confident size while maintaining a scrappy intimacy appropriate for a coming-of-age story. On either end of Harvey’s adventure, Captains Courageous goes on a bit too long; the circumstances of his boarding-school transgressions are needlessly overcomplicated, and the emotional denouement is less than concise. But the seafaring section that makes up the majority of the film is well-crafted and gives way to surprising emotion. Availability: Captains Courageous is available on DVD from Netflix or your local video store or library, as well as through the usual digital outlets.